Located in northwestern Massachusetts, Berkshire East is known for having the most challenging terrain in southern New England, as well as for a growing number of novice and intermediate trails. During a visit to Chickley Alp ski area, Arthur Parker saw Mt. Institute (a Charlemont mountain named by Horace Mann) and began dreaming of building a ski area. On November 18, 1953, Parker signed a lease for the property on the northwest face of Mt. Institute. Thunder Mountain was born. Thunder Mountain was hailed as a 'first of its kind' ski club in the December 20, 1953 New York Times, with its similarity to a golf club payment model. Memberships were offered for $30 (family) and $20 (single), with $2 day passes available for non-members. The area offered 3 trails and one slope, served by two rope tows. A skating pond was also available. Legend has it that in 1954, after one day of skiing, the rains came - and thieves; Thunder Mountain was closed and the rope was stolen off the rope tow. Hurricane and flood damage in 1954 was cited as the reason for the end of operation. The North Adams Transcript reported Thunder Mountain was hoping to operate 3 rope tows for the 1955-56 season, with plans being developed for a top to bottom T-Bar. There are no known accounts of the area opening that winter, and a subsequent Affidavit of Termination of Lease cited 1954 as the last year of operation. The area was considered 'dismantled' in 1958. Despite having the original Thunder Mountain fail due to weather and theft, Arthur Parker still kept his vision of skiing in Charlemont alive. On July 30, 1960, the lease for the original Thunder Mountain was formally terminated. A new 15 year lease was enacted starting on August 1, 1960, for initial cost of $1,000 for each of the first 5 years. Initial trail cutting was done mostly with the help of horses. The present-day Liftline and Competition trails were the first to be cut and graded. Two new Mueller lifts were slated to be installed once the trails were ready - a double chairlift to the summit and a T-Bar serving the Thunder Bowl slope. A new base lodge was also being constructed - the small lodge (still standing today near the end of Lower Mohawk) would not be enough to handle the new scale of operations. 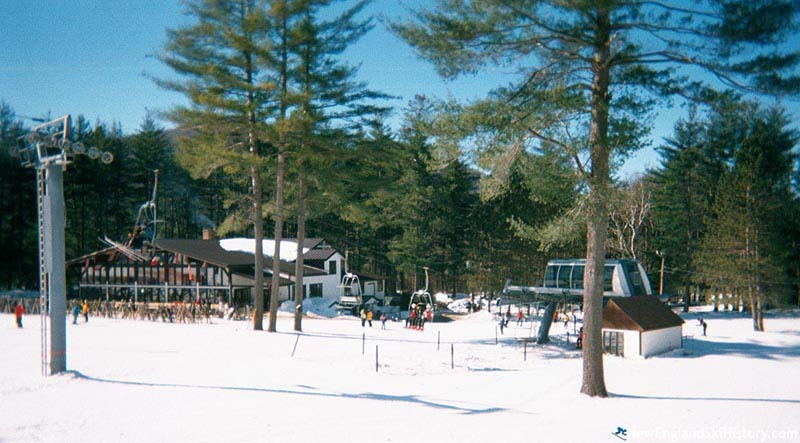 Thunder Mountain opened in 1961-62 at the top of the Massachusetts ski industry. With a solid thousand foot vertical drop, a double chairlift, challenging terrain, and snowmaking on the lower trails, Thunder had very little competition within the state. A sledding hill and an outdoor ice skating rink were also available. 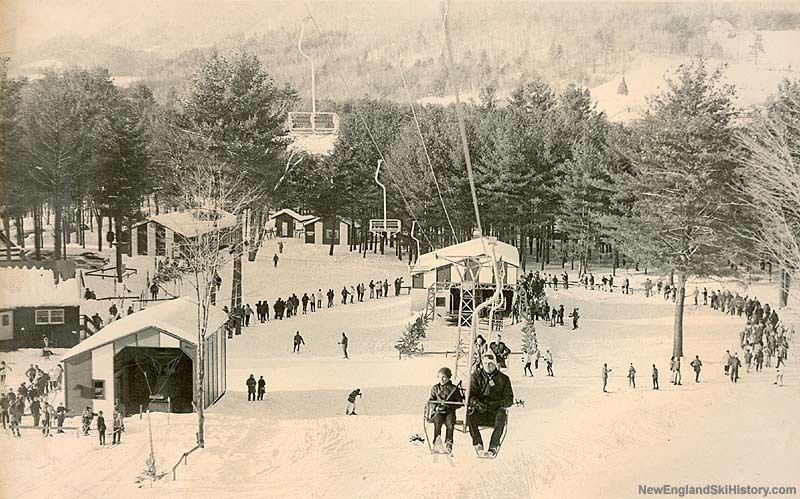 Early 'celebrities' on Thunder's slopes included Massachusetts Governor Endicott Peabody and Senator Edward Kennedy. 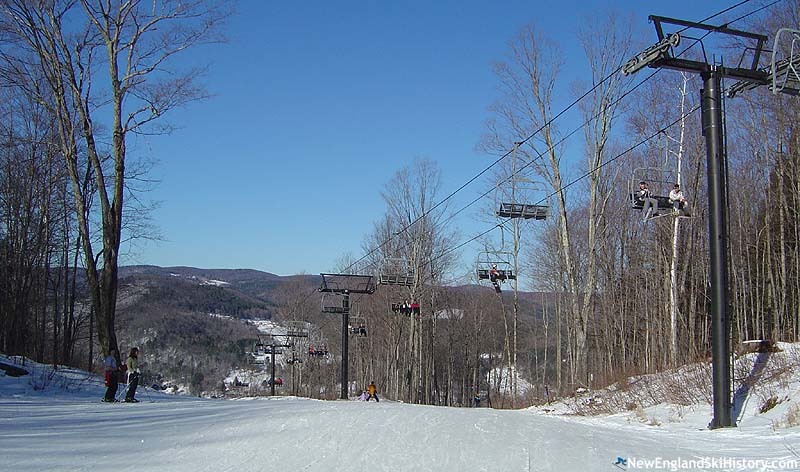 Drawing comparisons to Mad River Glen due to its challenging terrain, Thunder Mountain added a second Mueller Double Chair for the 1962-63 season in effort to appeal to novices. For 1963-64, the novice T-Bar was moved to a new slope cut adjacent to the new double chairlift. Things did not go smoothly, however. There were bills to pay, equity issues, and some bad winters. In the fall of 1965, Richard Tambussi bought over half the voting stock in Thunder Mountain and thus took over. Starting that season the new Natur Teknik of parallel skiing was taught by the ski school. In addition, a J-Bar was installed to replace the recently moved T-Bar on the new novice slope. 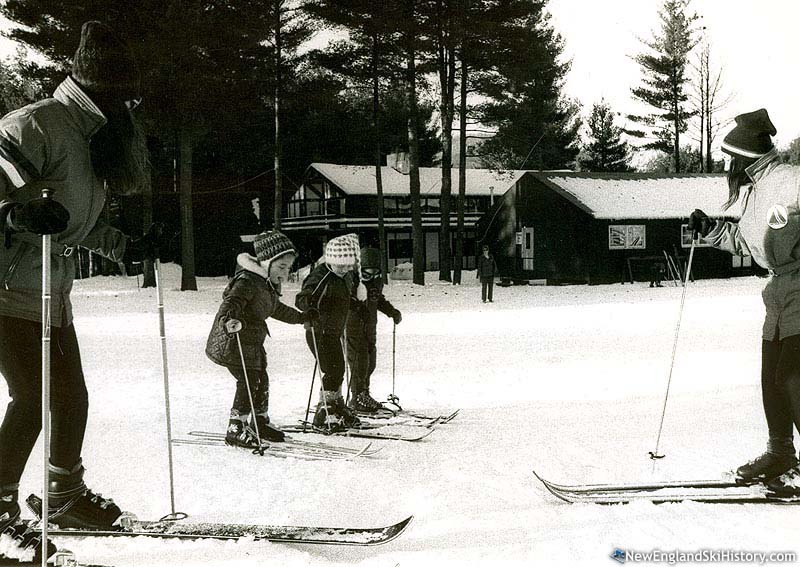 The mountain was renamed "Berkshire East" for the 1969-70 season, for ski conditions reporting and credit purposes. Most of the trails were also renamed, following more of an Indian theme inspired by being located in the Mohawk Trail region. An interesting addition in this time period was the construction of a second lodge - directly in front of the Main Lodge. This was done to force the owners of the Main Lodge to sell to the ski area's lease. Once accomplished, the lodge was moved and became the West Lodge. 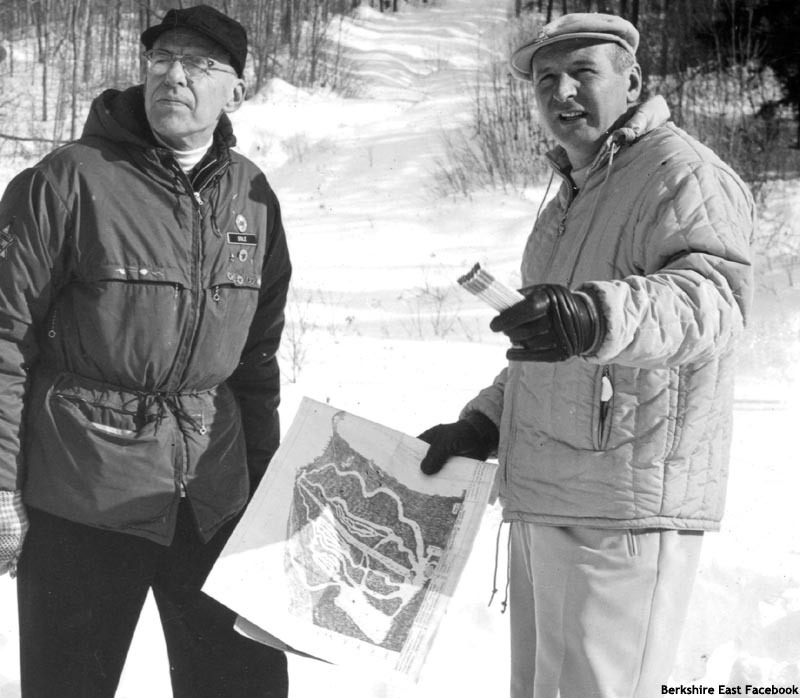 Richard Tambussi had big ideas for Berkshire East for the early 1970s - a massive development was planned, including three new chairlifts, shops, restaurants, a chapel, and many condominiums. The lower portion of the current Little Spruce trail in fact follows one of the development roads. The top of the present day Outback ski trail was the proposed site for a summit restaurant. In 1972, two Thiokol double chairlifts were ordered - a 1,700' long chairlift to run opposite the Exhibition Double and a 500' long chairlift to serve the beginner slope near the old lodge. Another double chairlift was planned for 1973, to run opposite the Competition T-Bar. Money woes hit, however. The small double chairlift was partially installed - the footings, three towers, and a top terminal were put in place and the base footings for the longer double chairlift were poured. The footings from the shorter lift are still visible from lower Big Chief and lower Mohawk. The base terminal area for the longer double chairlift was removed when the West Quad was installed in its place. By 1975, the owner of Berkshire East was a bank. The ski area was in jeopardy - money was needed to fix things up and smart management was needed to keep things running. An experienced ski resort operator from Michigan would soon hear this opportunity. Roy Schaefer, a ski area general manager and PSIA Certified Examiner, heard about a bankrupt Massachusetts ski area from an industry associate. After checking out the area, he decided to move his family to Massachusetts and run the area for the bank. 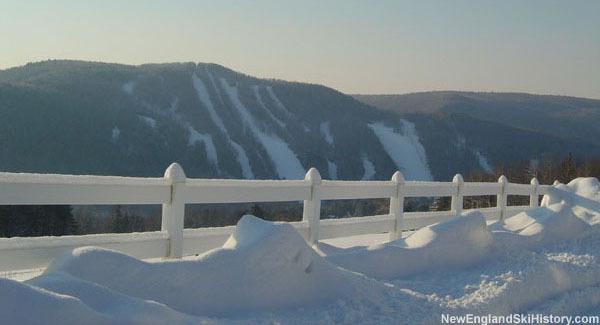 Schaefer saw issues with the area's snowmaking and lift system. As a result, he secured funds to modernize the aging Mueller lifts and upgrade the lacking snowmaking system. After a relatively successful season of operating the area for the bank (1976-77), Schaefer and Michigan corporation Union Terminal Piers bought the ski area. His priorities included adding fan guns, removing poor trails, lining trails with wind-breaking-snow-saving trees, adding/improving trails, and adding lifts. In 1977, Berkshire East built the Little Beaver complex, installing a 1000' SLI double chairlift purchased from a defunct ski area on Mackinac Island in Michigan. In 1978, Berkshire East purchased a Hall double chairlift from Sierra Ski Ranch in California and installed it on the Flying Cloud trail. This was the first, and to date only, Berkshire East lift installed via helicopter. One interesting note was that, while excavating the base area for the lift terminal, remains from a crashed plane were discovered. The exact date of this crash is not currently known, however the small plane apparently fell apart while still in the air. The management of Berkshire East leased nearby Berkshire Snow Basin for two seasons, from 1980 until 1982. High interest rates and poor snow years resulted in no large scale expansions at Berkshire East during the early to mid 1980s. Other than snowmaking expansions, some small trail additions/improvements, and the aborted Timber Village condo development (only two units built), there was not much to note. In fact, by the mid 80s, there was a reduction at Berkshire East - the aging Competition T-Bar was removed and the seldom-used Little Beaver chairlift operated for the last time. The late 80s promised to be intriguing. A massive condo development was proposed - up to 326 units were to be built near the West Lodge and the original Thunder Mountain areas. With this, the base area was to be rebuilt - a dramatic glass-dominated Main Lodge, a new building at the end of the parking lot, and some additional sports options. Six Deerfield River Club model units were built in 1988. Unfortunately, the late 80s real estate crisis hit, killing the rest of the project. After the Deerfield River Club condominium project fell through, things seemed quiet at Berkshire East. No lifts or sizable trails were added in the early 1990s. Behind the scenes, there was working being done. A capital campaign resulted in the installation of tower mounted fan guns on multiple trails. Night skiing was now available top to bottom on Big Chief, Flying Cloud, Upper Competition, Competition, Top Notch, and Exhibition. More importantly, big stuff was being planned. Chain saws and explosions could be heard in the 1994 offseason. Something big was going on, but it wasn't quite visible from Charlemont. A sizable expansion was taking place on the back side of the mountain, called The Outback. Four new beginner trails were cut that offseason - Ridge Run, Riva Ridge, Sun Dance, and Roundabout. Ridge Run, which would later be renamed Outback, required significant dynamiting, resulting in a small share of press coverage as far away as Boston. Ridge Run, Riva Ridge and Sun Dance would all open for the 1994-95 season, curing one of Berkshire East's biggest issues at that time - the lack of beginner terrain. After building the Outback complex in 1994, many were shocked to see the plans for the 1995 offseason. After nearly 35 years of service, the aging Summit Double was removed. In its place, a nearly-brand new Poma triple chairlift was brought in from the defunct Magic Mountain Ski Area in Vermont. In addition, a massively expanded base lodge was planned. With cooperative weather conditions, the crew was able to install the triple chairlift by crane - no helicopter was needed. The space age design of the bottom terminal quickly modernized an otherwise aging base area. After throwing a 100th birthday bash for local war hero Carroll E. "Pop" Adams Sr., construction on the lodge hastened - by the time the season rolled around, Berkshire East had a beautifully expanded Main Lodge with over two stories of picture windows overlooking the slopes. The lodge was now 250% larger and housed ski school and rentals under the same roof. In the fall of 1996, a two story addition to the lodge was constructed, featuring larger restrooms located on the main floor, additional kitchen space, and room for multiple new offices. Though the new offices were not immediately finished, the added space would eventually allow for the demolition of the antiquated Main Office building. Since the rental and ski shops had been moved to the expanded Main Lodge, the old rental shop building was up for grabs. Ski Patrol soon moved their operations to this building, rendering their old building behind the Diamond Express Double chairlift obsolete. With the old Ski Patrol building demolished, there was room for a gradual novice slope between the chairlift and the main parking lot. In the fall of 1997, clearing commenced on the Bobcat slope. A rope tow was also installed, though it would soon be replaced with a new handle tow. 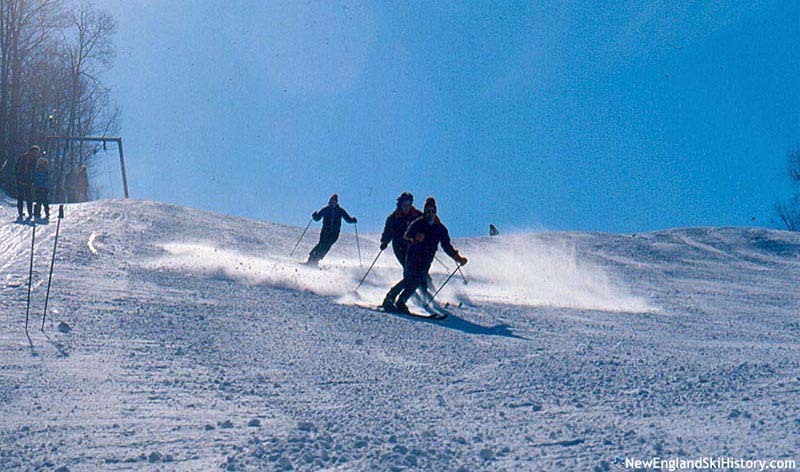 A major event shocked the Massachusetts ski industry in 1998 - the popular Mt. Tom ski area shut down and liquidated. Berkshire East made its first purchase of Mt. Tom equipment, acquiring a fleet of new Areco snow cannons and a modern fleet of Rossignol rental skis. Snowmaking crews absolutely buried some trails during the 1998-99 season. In fact, the snow on upper Flying Cloud was piled up higher than some of the tower snowguns! Though the last day of the season was at end of March, there were still significant patches of snow on the mountain well into the spring. As the 1999 off-season rolled around, there were some rumors being spread about more skiable terrain being added. Sure enough, locals spotted a new trail creeping up from the old Little Beaver complex. While this trail wouldn't be completed that summer due to lack of adequate equipment, four new trails were opened. Beast, a radical double diamond trail, was finally added to the map after a few seasons of unofficial status. Two glades, Horace's Grove and Tomahawk, were cut. Finally, a small new Outback trail, Snowdance (not to be confused with Snow Dance in the old Little Beaver complex), was cut to facilitate another addition - night skiing on Outback and War Dance. For the 2000-2001 season, Berkshire East added and improved numerous things. On the top of the investment list was a $300,000 snowmaking expansion. In addition, a brand new snowboard rental inventory was purchased. Finally, two trails were added to the map - Avalanche and Hayfield. While Hayfield would not end up reopening, Avalanche was cleared and remained an official trail for a few seasons. While this expansion was in progress, something big was happening near Exhibition - the Wilderness Peak complex was being cut. Beyond skiing, Berkshire East briefly became a school in 2001, as Hawlemont Regional Elementary School students moved to the Main Lodge while the school underwent renovations. One of the largest expansions in Berkshire East's history was planned for 2001-2002. With the recent logging on Wilderness Peak, five new trails were graded and 'opened,' including Roundabout (originally cut with the Outback complex), Hemlock, Little Spruce (the lower part following an abandoned housing complex road), and Wilderness Peak (the middle part of a proposed lift line). Due to one of the worst winters in modern history, none of these trails would open. 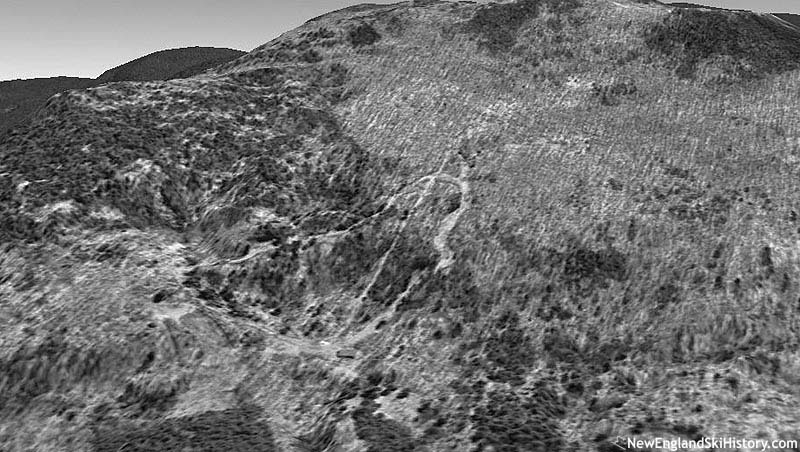 In addition to the Wilderness Peak trails, Upper Exhibition was cut to facilitate a planned double chairlift. The plans for this lift were placed on hold, however, two lifts would be installed. A brand new O'Connor handle tow replaced the never-opened Bobcat Rope Tow and a Hall double chairlift from Mt. Tom replaced the vintage Hall J-Bar lift on Top Notch. Beyond the trails and lifts, Berkshire East purchased hundreds of new rental skis from Temple Mountain ski area and seven brand new fan guns from SMI. The snow guns would come in handy in particular, as the cold weather and snow never really stuck. In fact, Berkshire East and many other areas closed in early March, cancelling the Cardboard Classic for the first time in recent memory due to lack of snow. After the poor winter of 2001-2002, off season expansion was expectedly low key. While other ski areas did little more than general maintenance, Berkshire East still kept moving forward, focusing on improving snow conditions. Two Bombardier snow cats were added to the fleet and the snowmaking system was once again upgraded. In addition to that, "Kenny's Condo" was torn down and replaced with a new, larger summit ski patrol building. Cold temperatures allowed for a strong start of the season, thanks to the expanded snowmaking system. The first "Skiing with Santa" (complete with a visit from the Grinch), event was held on December 22, dazzling kids of all ages. As is the trend, the March skiing was amongst the season's best. Two years after being cut, it was time to put the Upper Exhibition lift line to use. After forty-one years of service, the Mueller double chairlift was removed during the 2003 offseason. Its replacement, a Borvig-Leitner fixed grip quad chairlift, came from the defunct Berthod Pass ski area in Colorado. Due to lackluster snowfall and temperatures in late fall/early winter, the new chairlift didn't open until December 27, 2003. The addition was immediately noticed - families could now enjoy the west side of the mountain, including the Roundabout trail, day and night via a spacious chairlift. In conjunction with this, the West Lodge was renovated and opened for the first time in nearly a decade. Abundant natural and manmade snow allowed for tremendous late season coverage all the way up to closing day on March 28, 2004. After installing the West Quad in 2003, the focus of the 2004 offseason was to continue to improve snowmaking and grooming. In addition, some work was done on the Main Lodge, including updating the cafeteria area and building a short-lived bag check area. Despite an early November light snowfall, temperatures didn't allow snowmaking to start until December 13. Sizable snowstorms occurred on January 22nd, February 10th and March 12th. Good spring skiing allowed the ski area to stay open a week after the Cardboard Classic. As the 2005-2006 season approached, fall work quickly hastened. In September, some additional snowguns were delivered, further increasing the snowmaking firepower. In early October, the Mighty Mites building, better known as the long time Main Office building, was demolished (Mighty Mites would move to the former Bag Check room in the Main Lodge). In addition to these projects, additional snowcats were added to the fleet and some trail improvement work was done. The first notable snowfall occurred on October 25, with the top few hundred vertical feet of the mountain getting a dusting. Actual snowmaking started in late November, continued on December 3rd, allowing for the mountain to open the weekend of December 10th. Once again, decent late season conditions allowed the mountain to stay open through the last weekend in March. Many projects were underway during the 2006 off-season. In addition to significant snowmaking infrastructure work, a new trail was cut from the top of the Summit Triple to the top of the Diamond Express Double, allowing for an easier way down with better conditions. Finally, significant work was done on the Main Lodge, including painting, carpeting, and cafeteria renovations. Snowmaking started on December 4th and, despite seasonably warm temperatures, Berkshire East was able to open on December 8th with the West Quad. The top of the mountain opened the following day. Spring and summer like weather soon arrived, and the mountain was closed for an extended period at the beginning of January - temperatures reached 70 on the 7th! All was not lost, however, as the modern snowmaking system allowed for a quick recovery, as well as continuous skiing through the end of March. In July of 2007, word came through that Berkshire East had been sold by its parent corporation; Roy Schaefer and his oldest son Jim had purchased the ski area. Significant work was done in the offseason, including even more snowmaking expansion. The old ski patrol building (formerly the ski shop) was torn down and replaced. A tubing area, served by a Magic Carpet, was built on the bottom of the former Running Brook ski trail. A barn was built for the tubing area. Apparently Mother Nature approved of this work, as she provided the best winter in recent memory. As a result, nearly all of the terrain was open for nearly all of the season. The 2008-2009 season featured decent early and mid-season snowfall. Opening day was December 6th and closing day was March 22nd. At the end of the season, a new business named Berkshire East Canopy Tours was announced, with a 2009 opening. Berkshire East went green, with a 291 foot tall wind turbine completed near the top of the mountain during the winter of 2010-2011. A solar farm was added during 2012. Starting in 2011, a major mountain biking complex was constructed throughout Berkshire East and adjacent areas, named Charlemont Trails. 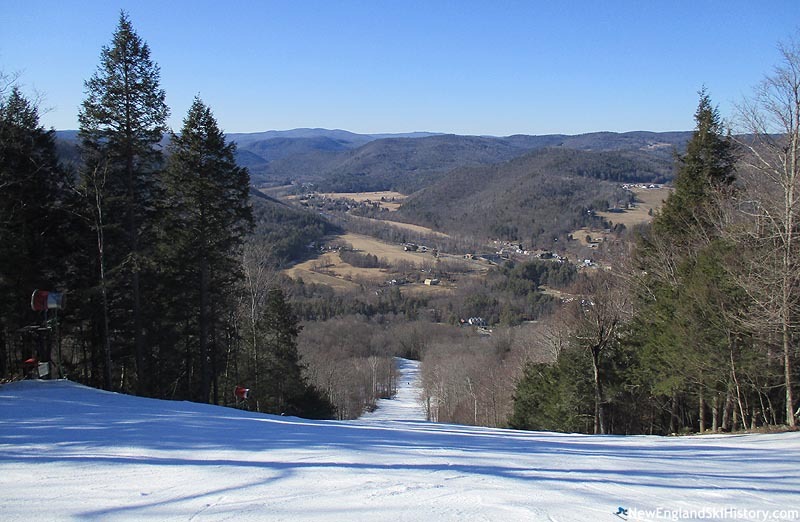 For the 2012-13 season, Berkshire East invested an estimated $1.5 million in snowmaking upgrades, including a new summit pond, new pumps, and new snowguns. Once fully operational in early winter, the new system dramatically increased Berkshire East's snowmaking firepower. Another sizable expansion was announced for the 2013-14 season, including a massive base lodge expansion and dozens of additional Areco fan guns. The UMass and Hemlock trails were widened and lined with the tower guns. In 2014, Berkshire East replaced the Summit Triple with a new loading carpet fixed grip quad, installed a mountain coaster, acquired 140 acres of land abutting land, purchased the Warfield House Inn at Valley View Farm, and started work on a downhill mountain bike park. The expansion of non-skiing activities continued in 2015 with the addition of a whitewater rafting business and the grand opening of Thunder Mountain Bike Park. Additional mountain bike trails and rope courses were added for 2016, while the groundwork was being laid for ski expansion on the north side of the mountain. "Taught skiing at Berkshire East the first year they opened after Thunder Mt. They were only opened weekends and Al Bobowicz was the ski school director. Stayed at the Charlemont Inn with some instructors from Chickley Alp. Had some of the best times of my life that winter. I should also mention that there was a restaurant bar in town owned by the ski area [The Black Stallion] that was our haunt after skiing." "I worked at thunder mt the first year in the ski shop and rental shop for art parker and Ray Ball ski shop owners.My family and children skied there for over 50 years from 1961 until 2011. MY son Barry skied every day he could and raced for Billy Farrell and Paul Putnam and many others couches and dedicated friends who supported Berkshire East and with many thanks to the Schaffer family and many others I will always have a fond memory of the area. I have skied over 70 different ski areas but my most enjoyable times were at the Beast"
"On a trip to Vermont last year I stopped and did a day at Berkshire East and had the best day of skiing as I ran into four other skiers my age and ability. It was the end of March and we had mid winter condition and we all did first lift and last. We stopped for a quick lunch and a couple of pit stops. What a great day we hadJon OsbornOSBORN2SKI"
"Started skiing at BE (Thunder Mountain) 1961, and loved the mountain regardless of the sketchy conditions back then, just more of a challenge as we used to say. Started on Ski Patrol 1968, the first year as B.E. (I believe). I'm still on patrol there and love the mountain just as much. Great things are happening with Berkshire East now. " "I learned to ski at Berkshire East over Christmas vacation when I was about 8 or 9 years old...we took lessons twice a day for a whole week....Berkshire East was (and still is) our family's go to mountain. My daughter started skiing there at age 3 and I started working there shortly thereafter.....we still continue to ski there and will, as it is such a great family place! Keep up the great work Berkshire East! "